My story of rice actually begins with last week’s cultured butter and 15 gorgeous eggplants from the farmer’s market. I adore all manner of Persian food, even the stuff that my Persian friends think is quacky (like “doogh” the salted, fizzy, mint-yogurt drink). Every fall when our markets are bursting with purple Thai, Japanese, and Italian eggplants, short small green and white globe eggplants and bitter (and aptly named) pea eggplants, I dream of Kashk-e bademjan, “eggplant with fermented whey,” one of the world’s most wonderful ways to prepare eggplant. 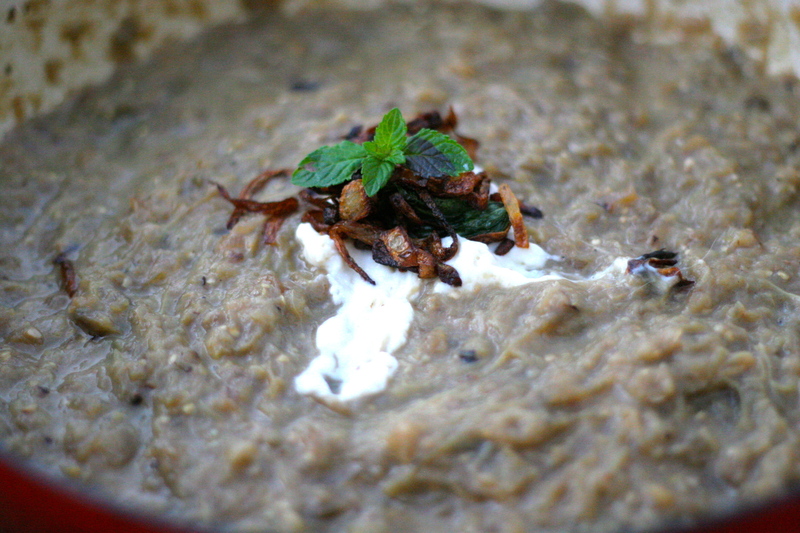 Kashk-e bademjan begins with a base of either roasted or fried eggplant that is cooked with caramelized onions, garlic, herbs, and sometimes a bit of tomato paste and smashed into a not-too-homogenous puree and then topped with the inimitably sour and almost cheesy tasting kashk, crispy fried onions and garlic, and mint. I eat it as is, with soft and warm, paper-thin Persian lavash bread, or as a side dish to rice. Having tried half a dozen recipes over the years, the one closest to my heart and taste buds is loosely based upon Najmieh Batmanglij’s New Food of Life: Ancient Persian and Modern Iranian Cooking and Ceremonies, the best Persian cookbook that I have encountered. As I planned out my eggplant dish, I determined to make my favorite Persian rice dish as well. Sometimes known as a jeweled rice because of the bright, jewel-like colors dotting the bright white long grains of rice, shirin polo has a complex mixture of sweet flavors and is often served for large celebrations like weddings. Does having a friend over who has been away for a couple of months count? I think so. I love spiced rices, especially various Indian and Burmese ones with cardamom, cloves, raisins, carrots, and peas, but in terms of sheer artistry and sumptuousness, Persian rices trump all. When I really analyze the preparation of Persian rices my affinity and love makes perfect sense. Persian rice is a lot like making Italian pasta. For me, Persian rice is the apogee of rice because, like a perfect prepared Italian pasta, it is cooked al dente and judged on how the isolated grains of rice stand alone, never sticking together in heaps and clumps of rice. 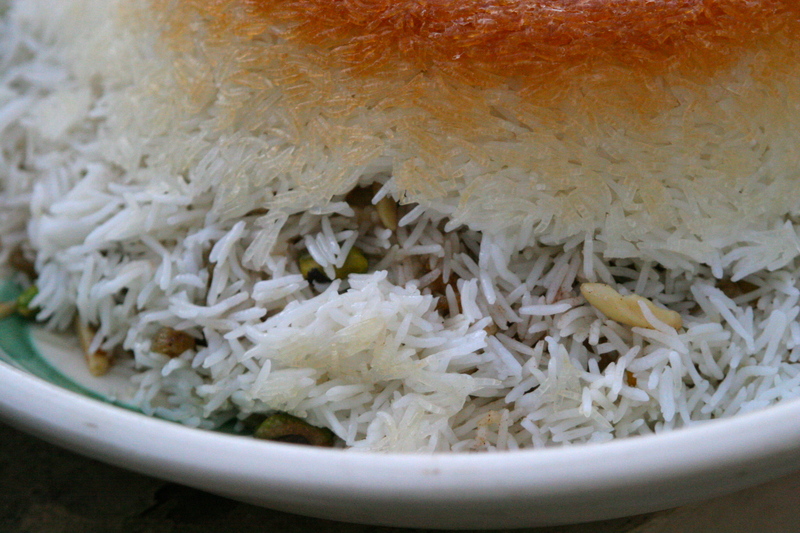 Persian rice is an art form. In its simplest incarnation, the long-grained basmati rice is rinsed until the water runs clear, soaked at length in cold, salty water, parboiled in salty water, and then left to steam in a pot over low heat until fully cooked. The end result is fragrant, fluffy basmati devoid of tacky, starchy clumps. It is a dish that could stand alone without being relegated to side-dish territory. Shirin polo takes these techniques a couple of steps further in that it is a flavored rice with some sort of dried fruit (barberries and/or raisins), a warm spice kit, pistachios, almonds, and candied orange peel. 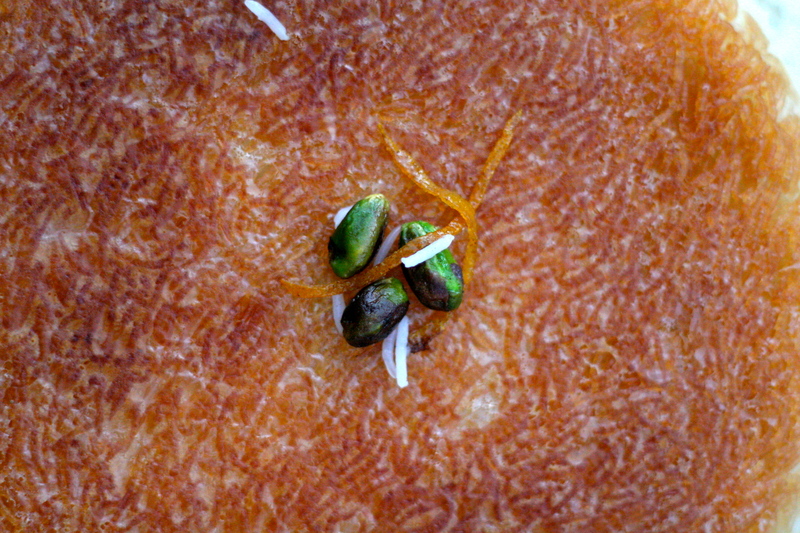 On top of that it has tadik, another phenomenal Persian culinary feat. During the final cooking stage, one makes a couple of deep holes in the rice and pours in several tablespoons of melted butter or vegetable oil. The crunchy top of the rice, "tadik"
The rice is left to cook on the lowest flame possible for about 45-60 minutes. In the process, the bottom of the rice begins to turn a golden color, with a crispy crust, redolent of popcorn and let’s-hunker-down-by-the-fire comfort. To serve, I simply flip the rice from the pot onto my serving platter so that the bottom becomes the top. 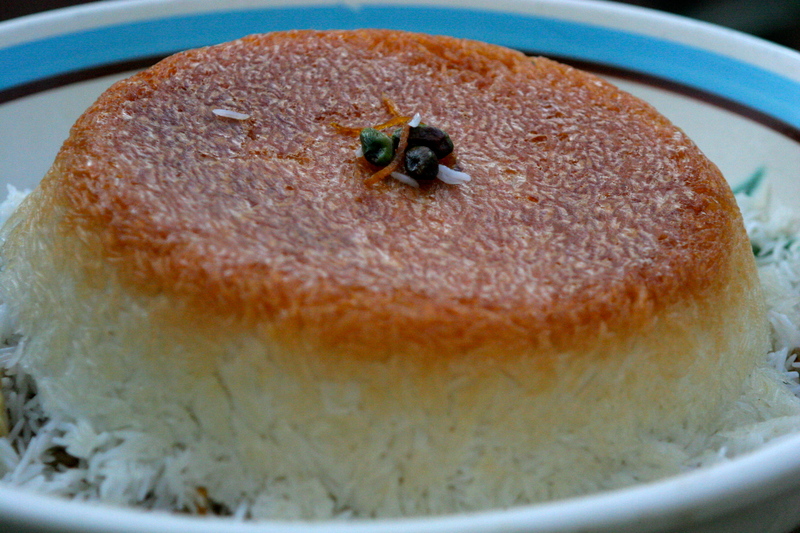 Note: Thanks to my sweet hubby, I now make this rice with my Pars Persian Rice Cooker. It allows one to do all of the rice cooking in one pot and then add the additional flavorings near to the end. I simply stir the candied nuts and orange peel into the top (soon-to-be-bottom) level of rice so that I do not break the tadik before flipping it all onto a plate. 4 to 24 hours ahead of time, place the rice into a mesh strainer inside a large bowl and rinse completely, five or six times until the water in the strainer is clear. Leave rice to soak in salted water for 4 to 24 hours before cooking. Drain the soaked rice. If not using a Persian rice cooker, boil a large pot of very salted water. While waiting for the water to boil, make the nut-peel mixture in a frying pan. 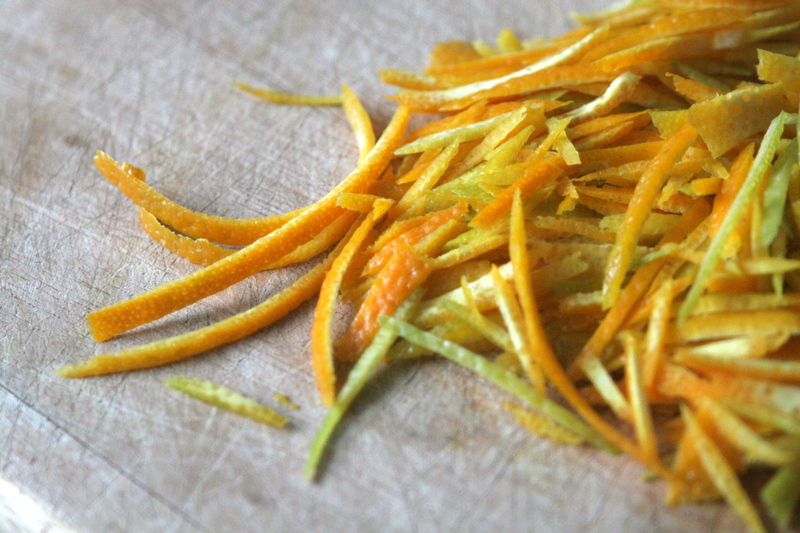 To make thin strips of orange peel, use a potato peeler to take off long strips of orange (not the white part!). Stack these strips on your cutting surface and then cut thin strips in a diagonal fashion so they are longer. Melt the 2 tablespoons of butter in the frying pan and then add the orange peel strips and cook for 30 seconds on medium-low. Add the 1 tablespoon sugar and the 1/2 teaspoon cinnamon and cook for another minute before adding the nuts. Stir to coat for 1 minute and remove from the heat. Add the raisins and/or barberries and set aside. Once the salted water is boiling, add the rice and cook to al dente, 3-5 minutes. Drain in a mesh strainer to avoid loosing grains of rice. Here you have a choice. If you like the nuts to soften, you can mix the nut-peel-fruit mixture into the rice before the long steam. I prefer to add mine at the very end. Coat the bottom of a fairly large pot (maybe even the one you boiled the water in) with the 1/4 cup vegetable oil/ melted butter. Mound the cooked rice in a mountain shape. With the back of a wooden spoon, make three narrow holes that reach to the bottom of the pot. Cover the pot with a clean tea towel, place the lid on top, and then wrap the ends of the towel over the top of the lid to prevent them from catching fire. Turn on the burner and cook on the lowest heat for 30-45 minutes. You can check how the tadik is progressing around 30 minutes by probing the edge with a fork to see if it has crispened. You want it to turn a golden color. Five minutes before finishing, remove a handful of rice and set it aside. In a mortar and pestal let the saffron threads soak in a tablespoon of hot water and then pestal them to a bright orange slurry. Add the handful of the cooked rice and stir until the rice turns bright yellow. If you did not add it already, stir the nut-peel-fruit mixture and the saffron rice into the top (soon-to-be-bottom) of the rice. Cover and cook for five more minutes. Take a large flat platter and swiftly, but carefully (maybe with help) invert the rice onto the platter so that the crunchy tadik is now the top of the rice. Serve each person a piece of the crunchy tadik with the rest of the rice. Peel and cut the eggplants lengthwise into long pieces no more than 2 inches wide. Lightly salt them and set in a colander in the sink for 20 minutes. Meanwhile, thinly slice one onion and 2 cloves of garlic. Saute them in 2-3 tablespoons of olive oil on medium heat for about 10 minutes, stirring every once in a while until the onions look soft and translucent. Once the eggplant has begun to sweat after 20 minutes, rinse off the salt and pat until each one is dry. Add them to the sautéed onion-garlic mixture and cook on medium-high until the eggplants and onions brown a bit. Add half a cup of water, cover, and cook on low for 30 minutes. While this is cooking, thinly slice the other onion and 2 garlic cloves and fry on high heat in a large quantity of vegetable oil. This should be fairly quick as the onions crispen and turn a golden brown color. In the last 30 seconds of frying this mixture, add some chopped mint. Strain the onion-garlic-mint mixture, lightly salt and set aside. Once the eggplant mixture is done, mash down the eggplant mixture a bit with a potato masher until it is more of a paste. Once the mixture has cooled to medium-warm stir in 1/4 cup kashk and taste for salt. Spoon 2 tablespoons extra kashk on top and then sprinkle with the crispy onion-garlic-mint mixture and serve. This entry was posted in Almonds, Dinner, Eggplant, Nuts, Pistachios, Rices, Vegan and tagged How to cook Persian rice, how to make Persian eggplant with whey, how to make tadik, Iranian rice, kashk, kashk fermented whey, Kashk-e bademjan, Persian almond orange peel rice, Persian eggplant recipe, Persian jeweled rice, Persian pistachio barberry rice, Persian rice, Persian rice cooker recipe, Shirin polo, Shirin polo recipe, tadik. Bookmark the permalink. Cuoca, you are truly inspired and inspirational. Keep the deliciousness coming, please! (Even though there’s *no way* that I can attempt anything so wonderful in my kitchen right now… sigh. Soon? Well, sometime, I hope. Danke, danke, but isn’t that the night I set fire to my favorite wooden spoon? First time checking out your site…very good, easy to follow recipes. I was telling a friend about Kashk-e bademjan and this was perfect. 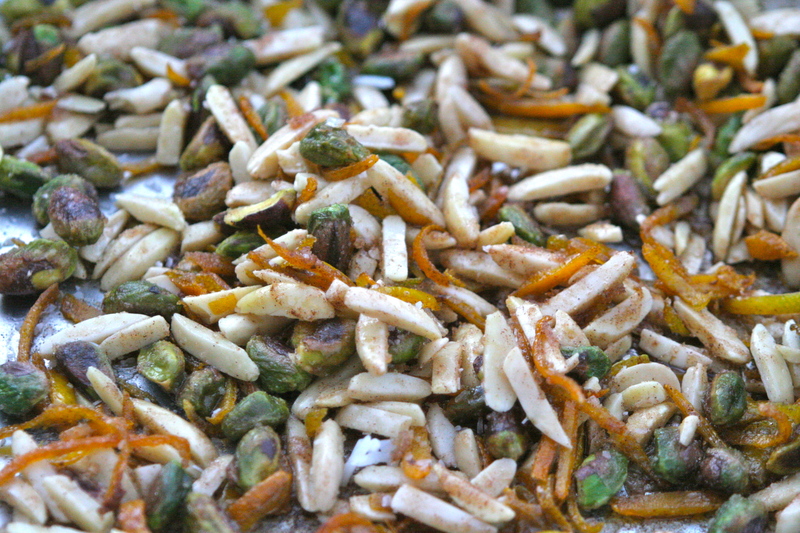 Just wondering if you have any more info about home-made kashk? My friend makes her own cheeses and yogurt so I thought this would be perfect. Thanks so much. Unfortunately I think I am going to have to track down a great great Iranian grandmother for this one. All of the Persian food experts I know purchase the canned kashk here in the U.S. and Ricki’s cheese company did not come up with anything for me either. I will let you know if I get something, but I have an idea of how it might be made. Hi, I have encountered two different recipes, have you tried them? If so, are these recipes any good?